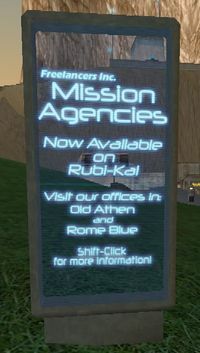 Freelancers Inc. Mission Agencies were added Rubi-ka with release 18.3.2. To help find these agencies, signs have been added to cities across Rubi-ka. At the agency, player's can request a daily mission to earn a large amounts of XP, rather than the small amount of XP and item reward of regular terminal / kiosk Missions. For player level 125 or less, each completed mission earns enough XP to increase one level. In addition Omni and Clan players earn twice the normal amount of mission tokens. If the mission involves killing lots of mobs it is possible to level up two levels while completing the mission. After level 125 it will take two daily missions to increase a level. Once a daily mission has been completed, deleted, or expired, you will get another mission that prevents you from taking another daily mission for 18 hours. Hence the name daily mission. But don't you worry their are four types of daily missions each with their own 18 hour timer. There two official mission agencies. One is located in Rome Blue (Omni,Neutral) and other in Old Athens (Clan,Neutral). 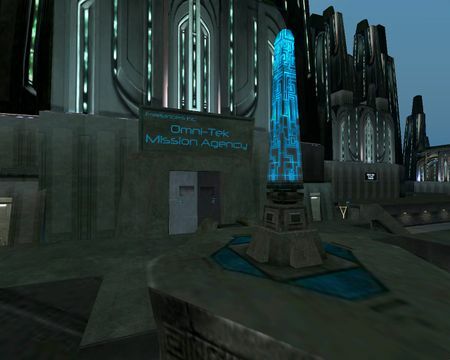 Omni uses the agency in Rome Blue. Clan uses the agency in Old Athens. Neutral can use either agency. To find the building and earn a little X, right-click on one of their signs pictured in this article. You will get a mission with directions and a map marker to guide you there. 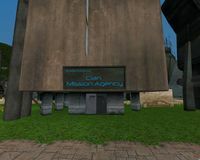 Neutrals can get two agency building missions from the sign. However, they are still limited 18 hour rule regardless of the agency they get a mission from. There is third location in Borealis for getting a unique Daily Mission which does not appear to be run by Freelancers Inc. Instead it is run by a group trying to influence the outcomes of Battlestation missions. To accomplish this they are offering Battlestation PvP Daily Mission to all players. As with regular terminal / kiosk Missions, when you get a mission to bring an item(s) back, there is only one specific entity to whom it must be delivered. Unlike terminal missions, where that entity is the exact same terminal that gave the mission, in the case of Agency missions, the Agency staff who gave the mission will not have an option to receive items. The quest should say who; usually the Agency Receptionist. Each mission type has a separate 18 hour wait timer before you can request another mission. The Agency in Old Athens is situated south-east of Hill, south of the grid and exits to the north of Whompahs. To get to missions talk first with the receptionist, then you can get at one of the three Agency handler for a mission. The agent may also asks if you want starter Rubi-Ka Quests based on your character level. The Agency in Rome Blue is located south of Rome Blue Basic (RBB) shop in the center of the zone. To get to missions talk first with the receptionist, then you can get at one of the three Agency handler for a mission. The agent may also asks if you want a starter Rubi-Ka_Quests based on your character level. Hidden in Borealis is an organization offering PvP daily missions to influence the outcome of Battlestation matches and change the controlling faction of notum mining fields. The mission's reward include substantial XP, mission tokens, and Victory Points. Once completed, you will need to wait 18 hours before requesting another PvP daily mission. These missions are available to all accounts. You can participate in Battlestation matches and Notum Wars without a PvP Daily Mission. To obtain a PvP daily missions, visit Borealis. Enter the building (Antiques n 'such) next to the ramp that leads up to the Rubi-ka Whompahs and near the Fair Trade. Once inside it looks like an antique shop with dealer selling items of questionable benefit. After a while you might notice other players coming in and disappearing behind a red curtain. That is where you need to go. Go down the hallway and look for John Smith. Talk to him to get your mission. Around patch 18.4.9, Shadowlands elite daily missions where added. Just like other daily missions you can get one and there is an 18 hour cool down period before you can request another. You obtain these missions from Jozef Swia located in the Jobe Research building Lab R1 aka DOJA Labs /waypoint 933.6, 909.7, 4001. This is also the building you turn in DOJA devices which provide the same rewards as a Daily Mission. Offers daily mission for character level 1-200. 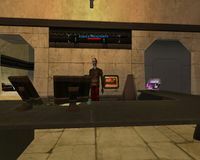 Sometime will also offer quests for your appropriate level that you can also obtain by talking to the appropriate NPC. Senior Agency handlers offers very tough missions which require a team or high level player to help with the mission. These missions reward enough XP to increase two levels with the standard daily mission double tokens. Note that while Subway now allows entrance until 25, the mission stops at 24 as before. Alien Invasion players have access Alien Daily Missions which reward the player with enough Alien XP to earn an Alien Invasion Perk. During the mission you will have the opportunity to kill aliens and earn more Alien Invasion Perks. Tip: Most alien daily missions when you exit before you finishing it you can return and find the aliens have spawn again. This allows you to earn more Alien XP to get more perks. "I want to face the aliens alone." "I want to face the aliens with my friends." Talk to John Smith and you can ask for the type of mission you want. Once completed you return to him to receive your reward. The "You got anything more tailored for me?" varies by your level and you might not be offered one. What do you know about illegal notum smuggling? Some of the notum tower sites are pretty hot right now. You got anything more tailored for me? 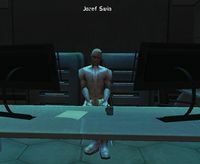 Talk to Jozef Swia in Jobe Research and mention you are here for the elite assignment. Based on your level you will receive a list of Elite Missions to choose from. You can choose only one. Elite missions are designed for teams and you might need to join a team to accomplish it. Cumulative, or stack, with other Rubi-Ka Daily Missions. Tokenboards are neck items for Clan and Omni-Tek characters. Higher token counts allow a character to upgrade their tokenboard. Neutrals cannot redeem tokens and do not get token boards; however, there are Neutral Neck Items. Tokens are earned by completing Daily Missions, killing sided guards in The Reck, or in terminal missions. They can come from Rubi-Ka Quests or, rarely, as mob loot. The higher level the character, the more tokens they receive; nine at 190+ and from level 1-14, one. This page was last edited on 29 August 2018, at 20:07.